Djinn City is an urban fantasy novel set in Dhaka, Bankgladesh, inspired by the Eastern mythology around djinn. As backgrounds for urban fantasy novels go, Bangladesh is not one I've seen used before, and I have a weak spot for stories about djinns, so I was quite excited to read the book. It is the story of various members of the Khan Rahman family. Indelbed is a young boy whose father Kaikobad is a drunkard and a black sheep of the family. He lives in a mansion in a poor area of the city, and Indelbed grows up neglected and hungry most of the time. One day, just as the rest of his family start to take an interest in his education (his father kept him out of school), his entire life is turned upside down. He finds his father in a coma and djinn have put a price on his head. Rais is Indelbed's older cousin. His father is an ambassador (what he is an ambassador to is hardly clear) and his mother, Juny, is a hard nosed, clever and ambitious woman. After Indelbed disappears, Rais eventually makes it his mission to find answers and, perhaps, Indelbed. 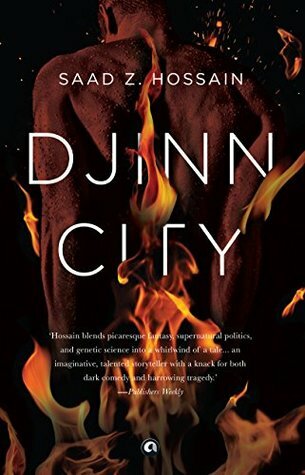 Djinn City starts out the way many fantasy novels start: young kid discovers that magic is real, that he is in danger from a villain, and is cut adrift from his family or orphaned to start his adventurous quest. He even soon finds a half-crazy mysterious but wise mentor. However, the book soon diverts onto different tracks. Time passes. Indelbed's journey is not one of delight and swashbuckling fun. Meanwhile, Rais, the young adult cousin, gets to have a much more traditional adventure, half detective story and half fantasy quest. However, Rais only succeeds because his mother does half the work for him, which is not exactly the orphaned-hero way of most heroic quests. Djinn City never got boring. There's adventure and intrigue and enough magical stuff to keep the reader entertained. Dhaka as a setting is refreshingly different, but it does not seem to be a very charismatic city: it could be any city in India or Bangladesh. The real heart of such novels is of course the magical stuff. Saad Hossain's djinn are an entertaining bunch, livening up the pages with their chaotic ways and charisma. No complaints here. However, it does jar a bit when the author tries to explain them scientifically (it's a pretty major plot strand). This simply fails: no matter how much effort is invested in describing djinn DNA and how they manipulate reality - they simply can't both be a single naturally evolved species and have the diversity of form that they do. While most are humanoid, one, for example, is a school of fish! Much to my surprise, the book is pretty cavalier about the wellbeing of its characters. It might start out like a fun little YA novel, but some of the events later on get a little Game Of Thrones-y with regards to trauma inflicted, to be honest. The story never quite goes where you think it will, and don't expect everything to be nicely resolved and closed off by the end. Not, on the whole, the fun little happy read you might expect from the premise.